Last week, as I was driving home from work, I smelled burning rubber and wondered if I had engine problems. Then I noticed that the car in front of me had a flat, shredded tire. I followed the car into a parking lot and got out to ask the driver if she needed help. She responded that she didn't know if she even had a spare tire in her car (note: almost every car has a spare tire of some sort up until the 2015 model year. Finding yourself stranded is the worst time to try to figure out how your spare tire works or if you have one. If you do not know where your spare tire is, go right now to find it, as well as the instructions for how to replace it. Go now. I'll wait to write more until you get back). Now that you're back, I can continue my story. While I was changing Kris's tire, she said numerous times, "I'm so glad that there was a guy around who knows how to fix a tire. This just isn't something that is easy for a woman to do." Any of my former Self Reliance students know not only how to fix a tire, but also how important it is for any driver to know how to do it. Some women may feel that it is hard to change a tire, but we can all do hard things. 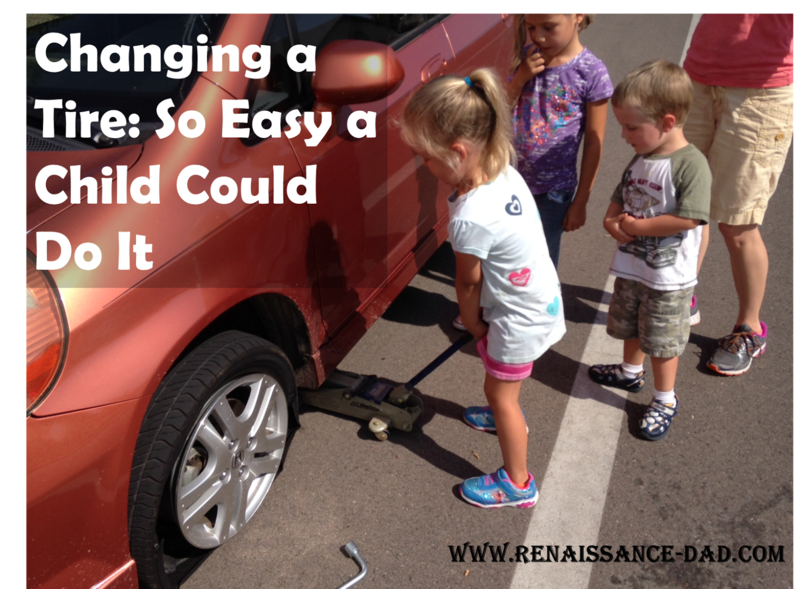 I was glad that I was there to help Kris, but I want my kids to know how to change a tire. I had a student last year who said that his dad never wanted him to have to change a tire. While it would be great, in principle, if we never had an emergency on the road, I want to make sure that my kids don't have to rely on a complete stranger for help and hope that he is a good guy. Let's back up a couple of months. I got a call that my wife, with all three kids in the car, had a flat tire and needed help. Now before you jump on her and say that a Renaissance Mom should know how to fix a tire, she absolutely does. But this flat tire happened in our neighborhood. And it was 110. And she had all three kids. So I ran over and had a teaching moment with my kids. They helped with every step of the process. 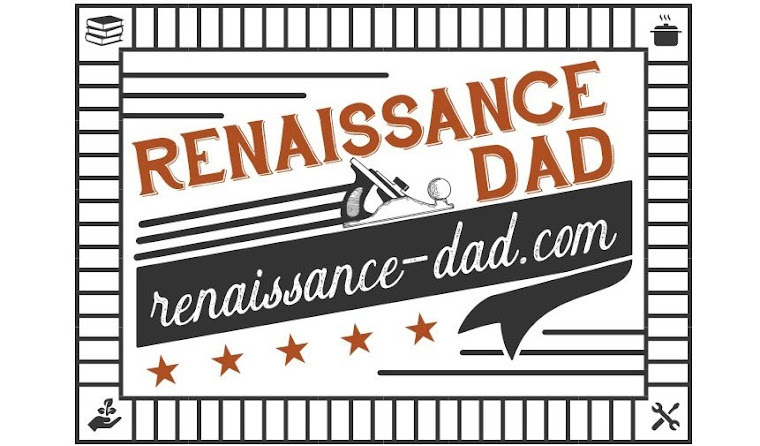 And in case you need a refresher on changing a tire, here are the 10 steps to changing a tire, ala Renaissance Dad. 1. Move to a flat, safe location. Parking lots are great. If you are on a road, move as far to the side as you safely can. If you cannot safely change a tire, call a tow truck to help out. 2. Get out the tools and the donut (small tire) or spare tire.These are usually found in the trunk of the car, the cargo area, or under the back seat. Of course you already know where they are because you looked for them after reading the first paragraph above. 3. Loosen the lug nuts. This is important to do while the tire is on the ground (otherwise the tire will spin as you try to loosen them). Loosen in a star pattern. If the lug nuts are tight, thank your mechanic or tire person for keeping you safe. Then put the lug wrench on the nut and stand on it. Even my kids with their 40 pounds have enough weight to loosen lug nuts by bouncing a little. 4. Following the car manual directions, raise the car using the jack. Most cars jacks have two pieces to the handle, allowing you to spin the handle more easily. The jack should be placed on the car frame. Remember that your flat tire has no air, so you'll need to raise the car until the tire is completely off the ground. 5. Remove the lug nuts in a star pattern, leaving the top lug nut for last. Make sure that if your kid is holding the lug nuts in the hubcap that you do not accidentally knock the hubcap into the air, thereby losing all of the lug nuts and causing your kid to say, "Fuuuuuuuuudddddggggge." 6. Place the spare onto the wheel and hand-tighten the lug nuts, beginning with the top one and moving in a star pattern. 7. Slowly lower the car to the ground. Slowly. 8. Tighten the lug nuts, again in a star pattern. You can again use your weight to make sure that they are tight enough. 9. Stow your tools and flat tire, and go straight to a tire shop to get a replacement. 10. If you have a donut, please DO NOT drive on the highway. Donuts typically have a speed limit of 50 mph, and a typical distance of 50 miles. If you drive for a couple of days, you will need a new tire AND a new donut. My good friend Stan once told me that the two most important things on a car were tires and brakes. And the two most neglected things on a car are tires and brakes. Keep your tires safe, and keep your family safe. Oh heavens! While different manufacturers have different limits to their donuts, I would say that you definitely pushed those limits to the extreme. You didn't go that entire distance on a donut, did you?